With a simple download, our software turns your iOS device into a badge scanner. Use the camera on an iPad, iPhone, or iPod Touch to scan a badge. 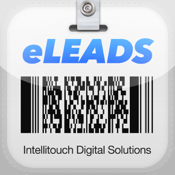 The barcode data is scanned, decoded, saved as a lead. Take notes, edit contact data, and review your leads at any time during the show. After the show, you can email yourself an Excel file with the contact information and notes taken – it can be used as is or imported into your favorite CRM.